Diaper rash is frustrating for both you and your baby. It’s frustrating for her because she doesn’t feel good, and it’s frustrating for you because, in some cases, it can be hard to get a case of diaper rash to go away. Sure, there are medications you can buy over the counter that may be able to help with your baby’s diaper rash, but you’re reluctant to use artificial chemicals on your baby’s skin. Air out the diaper area. This is usually the first, and certainly one of the most natural treatments for baby’s diaper rash. Let your baby lie down on a towel or a blanket without a diaper. This will help the diaper area to dry out and to heal. Diaper rash is very often caused by excessive moisture on baby’s skin, and allowing your baby to dry out once or twice a day can certainly help to heal and even prevent diaper rash. You’ll also want to make sure that your baby’s elastic diapers don’t have bands around the legs that are too tight, as well. If you’re using cloth diapers, use natural laundry detergents and softeners that are sensitive to baby’s skin. Consider a change to baby’s diet. Sometimes, diaper rash can be caused or aggravated by specific foods. If your baby has frequent diaper rash, consider changing formula. If you’re breast feeding, you can watch your own diet and avoid the kinds of foods that people tend to be allergic to such as nuts and berries, as well as spicy foods. Consider an all-natural diaper cream. There are a number of all-natural diaper rash treatments on the market. Instead of chemicals like propylene-glycol, or sodium lauryl sulfate, these products are based on shea butter, avocado butter, aloe vera, or various herbs and natural oils. If your baby’s diaper rash is severe or persistent, consider talking ot your pediatrician about possible treatment options, as well. Diaper rash is just one of those things that comes with having a baby. Most babies get diaper rash at some point or another, although some are especially prone to it. It can be frustrating when your baby has a bad case, because it makes her miserable and it can make you miserable for her. You need to start out by identifying what it is that may be causing the diaper rash if you’re going to treat it properly and reduce how often your baby has it. Excess moisture in your baby’s diaper area. Prolonged exposure of baby’s skin to feces or urine. Chafing of the diaper area due to poorly-fitting diapers. Irritation due to a specific chemical or a fabric. Preventing diaper rash, in part, means identifying what may be causing it in the first place. If you use diapers with elastic around the legs, make sure they’re not too tight. There should be enough room for air to circulate in that area. Change baby frequently so that her skin doesn’t suffer prolonged exposure to moisture or waste. With cloth diapers, test out different fabric softeners and laundry detergents, as one of them may be responsible for causing the diaper rash. If possible, let your baby go without a diaper for at least a little while each day. This helps to keep the area nice and dry. There is even some evidence that tells us that breastfeeding your baby might actually be able to help keep him from having diaper rash. Breastfeeding is thought to change the levels of certain acids in your baby’s waste, as well as boost your baby’s reactions to infection and other irritations. If your baby has severe diaper rash that’s causing her skin to become raw, or if her diaper rash is severe enough to make her inconsolable, you should talk with your health care provider about other ways to treat and avoid diaper rash. Swaddling helps with baby sleep. There are a number of studies, including a rather convincing study done at Washington University, that shows how infants will actually sleep better when they are swaddled. They tend to wake up fewer times during the night, and they get up to twice as much time in REM sleep – that sleep that helps with brain development. Swaddling helps reduce SIDS. Swaddling baby allows you to place her on her back when she sleeps. Back sleeping has convincingly been shown to reduce the incidence of SIDS (sudden infant death syndrome). In particular, back sleeping babies who are swaddled have a much lower incidence of SIDS. 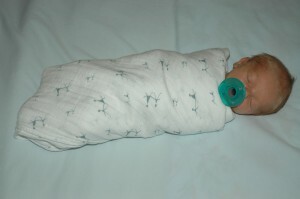 Swaddling helps to soothe baby. A snug baby is a calm baby. That tight, close feeling reminds them of the tight space they grew in while in the womb. A swaddled baby is much better able to self-soothe. Swaddling helps keep baby warm. Infants have a hard time regulating their own body temperatures. Swaddling keeps them warm consistently. Swaddling may help with breastfeeding. A swaddled baby can be much easier to breastfeed. Simply tuck his hands into your baby’s swaddle to keep him from interfering with his latching on. But, when exactly is it time to stop swaddling? For the most part, babies will be ready to be weaned from swaddling within the first six months or so. Other babies might need 8-10 months of swaddling. The key thing is to keep your baby unswaddled when she’s not asleep, so as to allow her the kind of range of motion and muscle-strengthening activity that she so desperately needs. When it comes time for your baby to be weaned from the swaddle, you can start with a single arm. If he’s still fussy and he’s moving his arm all around, he’s probably not quite ready to be done with swaddling.